CF Century Rides – A personal goal of Jerry Cahill’s. Jerry is determined to do a century ride (100 miles bike ride) in all 50 states for CF! 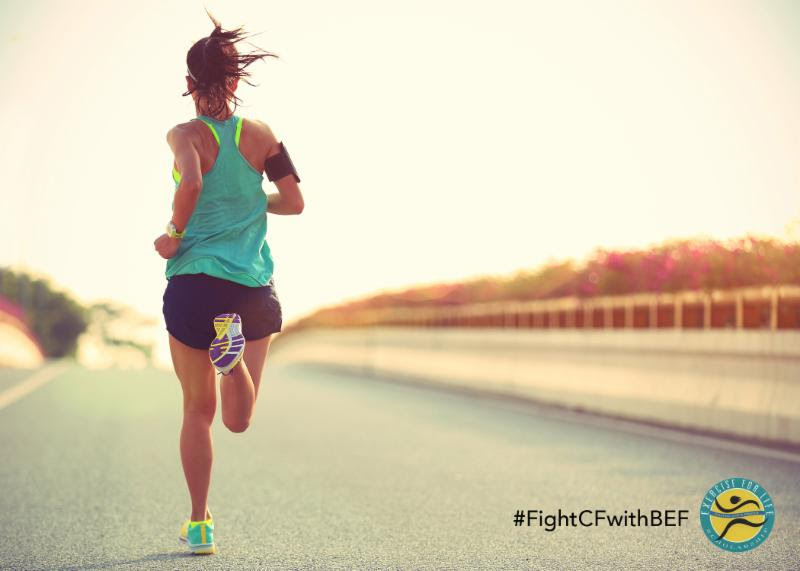 CF: Live By Example – A pilot program where people with CF who are living, breathing, and succeeding will ensure parents of newly diagnosed children that CF is only a bump in the road, not a death sentence. Approaching college while living with Cystic Fibrosis can be undoubtedly frightening. Although, great challenges bring great rewards. This is what I have come to learn during my time at the University of North Carolina at Chapel Hill. While I am only a sophomore at the university currently, I hope the knowledge I have gathered through my journey thus far will serve to touch others with CF. I believe that living with Cystic Fibrosis requires honesty with yourself and others. Therefore, I must be completely honest with you regarding the college experience while living with CF. I do not aim to discourage but to instead challenge you to prevail. I think a unique strength was placed within all of us with Cystic Fibrosis to surmount any challenge that presents itself in our lives. One of these being college, if you so choose. College with Cystic Fibrosis will certainly not always be easy. As you may know, sick days, lengthy therapy routines, and hospitalizations come with the territory. Combine all of this with the pursuit of higher education and one can become overwhelmed. Balance and prioritization become key in the life of a college student with CF. I know I have spent countless nights reading my textbook while my Vest was simultaneously shaking my lungs. There have also been times when I completed assignments while lying in my hospital bed. This is where balance comes in to play. Finding a system that makes time for both school and health care is crucial, but I want you to be certain that it is also achievable. Despite some extra setbacks and effort, I finished reading all of those pages in my textbook and an assignment has yet to be turned in late. Now, this is where prioritization becomes a major factor. In order to be an efficient student, your health must come first. If doing both becomes too taxing on your body, please remember that it is ok to give yourself a break from school. This has been a difficult lesson for me to learn as a student who always strives for perfect grades. The times I have put school before my health, it has never worked in my favor. I only became sicker, causing a worse impact on my academic performance than if I would have taken the time to recover initially. Carving an hour or so out of my day for therapy when I first noticed signs of sickness would have been much easier than the eventual hospitalizations that resulted from the neglect of this fact. Always put your health first. The aspirations you are seeking through your college journey can only become a reality if you are alive and well to participate in these realized dreams. All of this may seem rather challenging. So how does all of this ultimately become rewarding? Well, that is entirely up to you. I’d like to give some insight on how this process has rewarded me, personally. This might be the same reasoning that inspires you to pursue higher education or you might have a unique drive that motivates you. Either way, hone in on this sense of why it is all worth it. Each day attending college rewards me because it serves as a constant reminder that I am equally as capable as anyone without Cystic Fibrosis. We are all different and many of us have encountered at least some degree of a setback in our lives. Mine just happens to be Cystic Fibrosis, but I can work with this along-side my peers. One classmate may have had a parent pass away, another battled a different disease or any other challenge that life may present. Yet, we can all come together in one classroom in order to learn and grow as equals. College allows me to reflect on the fact that the circumstances life presented me with do not define me as lesser. Instead, they exist to strengthen me so that I may become more. Life with Cystic Fibrosis has not been easy and this has never been truer than in my time at college. As I sit here now, I can still honestly say that I am happy to have Cystic Fibrosis. We are forced to realize how special we truly are when challenged by this disease. Yes, I have experienced setbacks and hard times while in college. They have not defeated me and they will not defeat you. At times, I may have to exert extra effort because of my CF. The reward of knowing that I got the job done regardless is much greater than any challenge that college or Cystic Fibrosis may introduce.